Description: Francesca (Wilburn) Ritchie, daughter of ABS Mastersmith Aaron Wilburn has been providing quality exotic leather goods under the name Wilburn Forge Leather. 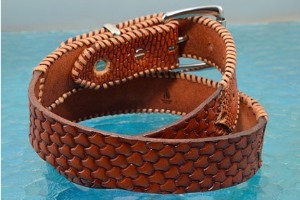 This handmade one-of-a-kind leather belt is a fantastic example of her work. 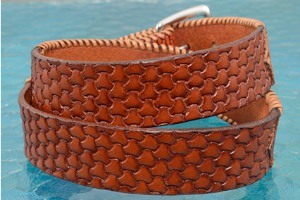 Francesca started by tooling a pattern on the leather then stitching premium beaver tail leather to the outside. 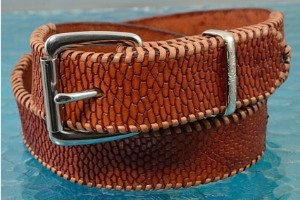 The belt was then laced to give it an elegant appearance. Wilburn forge is stamped on the interior. Six slotted holes allow for adjustments to ensure the belt is comfortable. 0.328125 0.0615234375 328.125 61.5234375 Trailer Started. 0.5166015625 0.1884765625 516.6015625 188.4765625 Trailer Completed.